Life cycle: They reproduce in moist, shaded soil areas with high decaying organic matter such as leaf litter. The life cycle is about four weeks, with nonstop reproduction indoors, in greenhouses or in gardens where warm temperatures and wet conditions exist. Broods overlap, with all stages present during the breeding season. Larvae not only feed on fungi and decaying organic matter, but on living plant tissue, particularly root hairs and small feeder roots. Physical Description: Larvae are legless, thread-like, white, shiny blackheaded, up to 1/4 inch (5.5 mm) long and transparent so. Pupae appear in silk-like cocoons in the soil. Adult are small about 1/8 to 1/10 inch (2.5 mm) long, grayish to black, slender, mosquito-like, and delicate with long legs, antennae and one pair of wings. The adults are poor fliers, but are important pollinators, and help spread mushroom spores, and live 7 to 10 days and lay their eggs on moist soil surface. Females lay up to 100 to 300 eggs in batches of 2 to 30 each in decaying organic matter. Eggs hatch in 4 to 6 days; larvae feed for 12 to 14 days. The pupal stage is about 5 to 6 days. There are many overlapping generations throughout the year. Feeding characteristics:These insects aren't normally a problem in the garden unless found in large numbers and the conditions are continuously warm and moist. The larvae feed on the roots of bedding plants, African violets, carnations, cyclamens, geraniums, poinsettias, and foliage plants. Fungus Gnats also aid in the decomposition of organic matter. This is great for compost. Plant damage symptoms appear as unexpected wilting, low vigor, poor growth, leaves yellowing and defoliation. 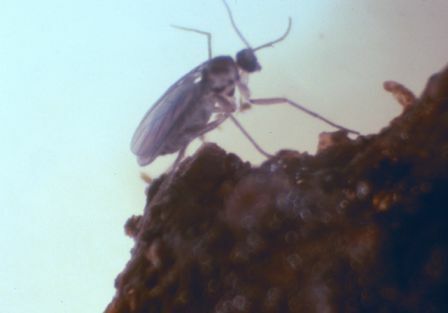 In houseplants, the presence of Fungus Gnats may indicate over watering. They may be feeding on roots that have sat in drain water too long and are rotting or may be attracted to fungus growing in saturated top soil. Drain excess water from the plants drain-pan and allow the soil to dry will eradicate them. They are harmless animals and healthy plants. Controls: First, prevention should be your goal, and this is to avoid over watering, especially in high organic soils. Adult Gnats are easily killed with pyrethrum and soap sprays. They can be controlled by the Predatory mite, Hypoaspis miles. The H. miles, is a voracious predator of mites and insects that spend most part of their life cycle in the soil, including Gnat larvae and pupae of thrips. Once introduced, H. miles usually can reproduce and establish. Other biological controls are re Ladybeetles, Green Lacewing, Minute Pirate Bug, Beneficial Nematodes , and Bacillus thuringiensis var. israelensis.